Few of us have a choice in how we die. We can eat healthfully, exercise, appreciate the good days, and hope for the best. But Christine W. Hartmann’s mother, Irmgard Hartmann, decides to take matters into her own hands and carefully plans her suicide for the age of seventy, before she risks becoming too elderly and sick to enjoy life. By contrast, Hartmann’s father lives in the moment and plans only minimally for the next stage of life—which means the burden of care falls on Hartmann when he suffers a stroke and remains incapacitated through the next few years, falling further and further into illness and dementia. 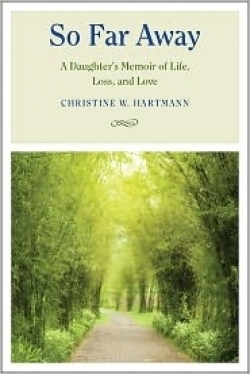 In an intelligent, sometimes harrowing examination of her mother’s calculated death and her father’s long illness, Hartmann, who has Ph.D. in social work and teaches at Boston University, describes a grieving process that begins twenty years before anybody dies. These two extreme end-of-life scenarios teach Hartmann the power of human connection, even as she discovers her own way through life’s boulders via a flawed first marriage and a serious bout of depression. Hartmann weaves her story by traveling backward and forward in time to describe her father’s illness and her mother’s plans, but readers are never left confused about the timing. Instead, memories and flashbacks enrich her story. She also delves into descriptions of her own depression with clarity and reason. readers will find joy in the carefully constructed phrases that emit beauty even when describing pain. Grief is an individual process and dependent on situations, personalities, and relationships, but Hartmann offers personal discoveries that feel universal. Many readers will find familiar themes and emotions. Her book is a gift for anyone struggling to come to terms with death or depression.